VCU @ UVA, which sections? I know it's a while off, but there are a lot of tickets available on Stubhub. I'm thinking about picking up 4 tickets for the family, but would prefer to sit amongst other VCU fans. Do others already have tickets? If so, which sections are folks siting in? I'm also thinking about making the trip. Would rather sit around other vcu fans. Couple of Rowdy Alums and I are trying to get tickets all together generally. Haven't figured out exactly where yet though. I think we are up to about 7 people going so far. There was high drama the first time VCU met U.Va. on the hardcourt (Dec. 29, 1976) .... Rams drew the Cavs in first round of inaugural Times-Dispatch Invitational at the Coliseum ... things got off to a testy start during warm-ups when U.Va. trainer Joe Giek shouted to first-year VCU coach Dana Kirk: "hey, Dana, where'd you get that suit, K-mart?" Dana, famous for his wide collars and leisure suits, did not take kindly to the comment ... VCU was depleted by defections that year and a heavy underdog. Still, Rams hung tough, losing by just 65-58. Leading scorer for Rams was Chip Noe, son of ex-VCU coach Chuck Noe. Also, Chuck Noe was a U.Va. alumnus. You've got realize U.Va. has absolutely no respect for VCU at the time. Famously, Rams' fans chanted "VCU! VCU! VCU! when things were going well. U.Va. fans retaliated "VCU-Who? VC-Who? VC-Who." Much to their credit - and I'll never forget this - Rams fans, though greatly out-numbered and likely intimidated, countered, enthusiastically with ... VCU!!! VCU!!! VCU!!! only much much louder. I was there but my memory isn’t as good as ‘horn’s. Ordering tix this week. Where are the Rams fans going to be? Last time VCU played at JPJ there was not a specific VCU section. The VCU fans surrounded the court on the upper level. Are you gonna wear Retriever gear? Enter to Win a VIP Experience at VCU Game! We've partnered with ReplyBuy to offer fans priority access to last-minute tickets that can be purchased with a simple text message. 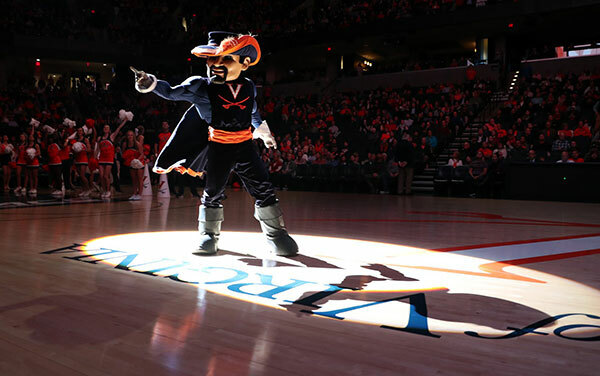 Register your new ReplyBuy account by Monday, Dec. 3 and be entered to win a VIP ticket package for the VCU game on Sunday, Dec. 9, including two (2) lower level tickets, parking, free concessions items and Virginia Basketball swag! You'll also get $10 off your first Virginia Athletics ticket purchase through the platform.